Jupiter Hotel is located on the privileged location in Praia da Rocha, just 70 metres from the beach and within walking distance of countless shopping and entertainment venues. Links to the local transport network can also be found nearby and the centre of Portimao is approximately two kilometres away. the Jupiter Algarve Hotel is the perfect choice for those seeking a memorable stay. Links to the local transport network can also be found nearby and the centre of Portimao is approximately two kilometres away and less than 2 km from Praia Grande Beach and Vau Beach. Activities in the surrounding area include golf, water sports, boat trips, and dolphin-watching trips. The Recently renovated, the Jupiter Algarve Hotel features a sea inspired décor. 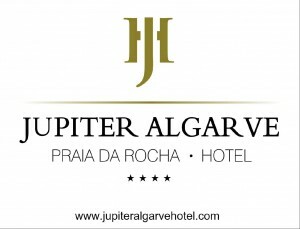 All guest rooms at Jupiter Algarve Hotel are air conditioned and include a minibar and satellite TV. All rooms are en suite, and some have balconies with sea views. Every morning a hot buffet breakfast is served at the on-site restaurant and is included in the rate. The restaurant also serves a buffet or à la carte dinner featuring Portuguese and international dishes, plus live show cooking. Jupiter Algarve Hotel has a pool bar, featuring live music and dancing every night. There are many restaurants and bars within a few minutes’ walk. Guests of Jupiter can relax at the sauna and enjoy a massage or a steam bath. The hotel also features a fitness centre with a free of charge gym and is near to several golf courses. Meeting and event rooms with capacity up to 300 persons are available.